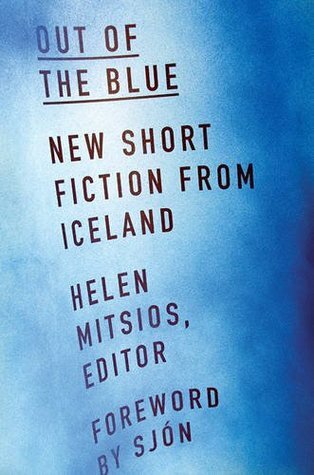 Out of the Blue is an outstanding collection of short and short-short works of literature from Icelandic authors. In the foreword, Sjón writes “Icelanders read and write more books per person than to inhabitants of any other country.” That’s pretty impressive, and more than a little surprising given that I’ve only just started to encounter Icelandic authors in my reading journeys. But it is because I have started to encounter more and more Icelandic authors that I was drawn to this book. This collection of twenty short stories is s nice introduction to the tenor of the Icelandic literary voice. But let’s be clear about something … these are Icelandic authors. That doesn’t mean all the stories are set in Iceland or tell about the serene beauty of this Scandinavian country. This isn’t the case. But the stories do convey a sense of the Icelandic whimsy and forlorn longing that is best told by a peoples who live on a large, volcanic island and spend much of their year in dark and cold. As with nearly any anthology, there were stories that I enjoyed and stories that really didn’t do anything for me. Among my favorites were “The Horse in Greenland” by Einar Már Guðmundsson; “Killer Whale” a very moving story by Ólafur Gunnarsson; “A Pen Changes Hands” by Óskar Árni Óskarsson; “The Most Precious Secret” by Einar Örn Gunnarsson; and “Scorn Pole” by Þórarinn Eldjárn. These stories reflect the wide diversity of the stories in the collection – from humorous to moving to reflective. Although it’s never obvious or foremost in the writing (I would never consider any of these stories ‘fantasy’) there is a sense of the mythological history of Icelanders in the writings. Icelanders are, as a gross generalization, a superstitious lot. Only recently I read where a department of transportation re-routed a road rather than remove a large boulder because of the community’s belief that elves inhabited the stone and would cause great mischief if the stone were removed. Literary fiction from a country where this would happen manages to let this sense linger in the background for those readers ready to see it. This was a nice collection and I’ve added some names of authors for whom I want to read more. Sadly, much of their work is yet to be translated into a language I can read. Looking for a good book? Out of the Blue is a beautiful collection of short fiction by Icelandic writers and as such, offers a glimpse into the life of Icelanders. It is a marvelous collection and well worth reading.